The headlines are everywhere: Blockchain is taking the world by storm. But when you scratch the surface of this trend, the conversations among developers are less about the possibilities of this brave, new world and more about who’s going to actually build it. And I believe that’s the biggest problem we have as a blockchain community. After all, blockchain is still considered an emerging technology. And while I reject the claims by some that there are only 5000 people worldwide who are dedicated to writing cryptotech-related projects, the demand for blockchain developers far exceeds the supply. Freelance blockchain engineers on Upwork are asking as much as $200/hour. Burning Glass Technologies, a Boston-based analytics software company, says job postings requesting blockchain skills more than doubled in 2017. Developers with blockchain experience can command salaries from $150,000 to $250,000 and more. And those salaries don’t include the mother of all benefits: Equity in a pre-ICO company. Another big lure is the promise of working on some of the coolest projects around, initiatives that could literally change the face of global economics. “Because blockchain is pushing the envelope in terms of cryptography and secure protocols, developers are more likely to get experience with cutting-edge technology that will later be adopted by other segments of the digital economy,” writes Yael Grauer for Dice. Working with a major fintech firm. “IBM, for example, who was recently named the #1 blockchain vendor by Juniper Research, has more than 400 blockchain projects in progress, employs more than 1,600 employees and has more than 150 job openings related to blockchain,” writes Jason Kelley on the IBM blockchain blog. Working for a consumer tech firm. Eastman Kodak recently announced that it’s partnered with WENN Digital to launch a cryptocurrency for photographers called KODAKCoin. And in the past 24 months, both AirBnB and Overstock.com made headlines with their crypto/blockchain initiatives. “Uber, eBay, Capital One, Match.com, and GEICO number among the ranks of companies that have searched for and/or contacted candidates who have listed ‘bitcoin’ or ‘blockchain’ in their skillset,” writes Laurence Bradford in Forbes. Working for a crypto startup. “The large sums of money going into the cryptocurrency space, from ICOs, to VC financings, and the price appreciation of Bitcoin and Ethereum, has led to a hiring boom at cryptocurrency startups,” according to Angel.co. Working for a government. From Dubai to Delaware, government entities at all levels are investigating what blockchain can do to improve their services and make their operations more efficient — and they need talented workers to help them in their quest. Working for a non-profit. A number of non-profits and NGOs are implementing blockchain programs, including the United Nations World Food Program, Mercy Corps, Clean Water Coin, and more. 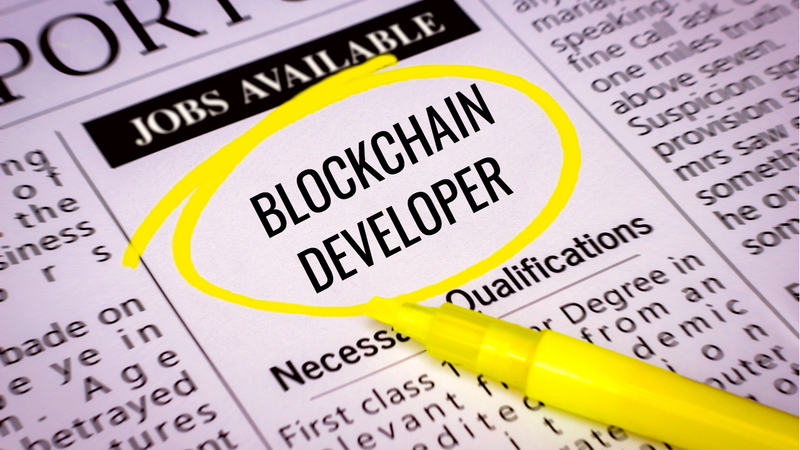 Some estimates say that for every one qualified blockchain developer on earth, there are 14 available jobs. And in a recent survey of Fortune 500 executives, 94 percent said they had plans to implement blockchain technology… but only 6 percent thought they’d be able to locate the talent needed to make those plans a reality. Drawn by the mating call of cutting-edge projects and high compensation, more and more engineers are looking to the transition their skills to the blockchain. If you’re a dev who wants to beat the crowd, the time to jump is now. How do you get a job in blockchain? So you’ve decided you want a job in blockchain. Good decision! But if you’re not a crypto expert, you’re going to have to work at it. You can wait for traditional education to catch up and go back to school for a degree. You can seek out an accredited program to learn what you need to know right now. Let’s take a deeper look at the pros and cons of each of these approaches. Self-education. ““You can learn an incredible amount about cyber security just by studying the Blockchain. Also a distributed ledger, there are other benefits in studying the technology, as well as learning the skills needed to build a Blockchain,” Aggelos Kiayias, Chair in Cybersecurity and Privacy, Director of the Blockchain Technology Laboratory at Edinburgh University told CoinTelegraph. This option is great for those with more time than money… but it could take a while and you’re basically flying blind. And while you’re struggling to deconstruct some blockchain app, other developers are taking the direct route and beating you to the punch. Coding/Bootcamp. While this is an option, to say “your mileage may vary” is putting it mildly. You could pay as much as $10,000 and still not have the skills you need to get hired, or to work on a cutting-edge initiative. And even with your certificate in hand, these courses can cause more eye-rolls than head-nods among hiring managers. “Our experience has found that most graduates from these programs are not quite prepared for software engineering roles at Google without additional training or previous programming roles in the industry,” said Maggie Johnson, Google’s director of education and university relations, told Bloomberg, and reps from Cisco and Autodesk concurred. Traditional Education. “Some higher educational institutions are just beginning to offer courses for studying blockchain,” writes Jason Kelley, General Manager, Blockchain Services for IBM. But there is typically a lag between the emergence of a new technology and the adoption by traditional educational institutions. And we’ve already talked about how that lag can kill your opportunities. Speed is of the essence. Accredited Programs. Fortunately, there is an alternative to these other options, one that gives you the standardized curriculum you need, backed by a known, trusted institution. With accredited programs, you can learn the skills you need to successfully embark on a blockchain career. By teaming up with some of the visionaries in the fields of cryptotechnology and blockchain, these programs can work with the people who are building the core technologies of this industry, and then bring that education to aspiring developers. Academy is the first of these accredited programs, and after you’re trained, Academy will help you find a job that fits your skills and interests. Academy is working to set the course for education in this new and emerging ecosystem.